After a happily uneventful flight across the pond, we exited the Munich airport and headed towards the S-Bahn station. We were greeted by a beautiful modern outdoor terrace, featuring no less then it's very own brewery... AirBrau! I had come to Munich for the beer culture, and though Oktoberfest was not in the recent past nor approaching future, I knew I wasn't going to be disappointed. German beer culture starts at the airport. First stop was Marienplatz, the historic centre of Munich. You are instantly taken in by an "awe moment" as you raise up the subway escalator and into the square. The towering Neues Rathaus (New Town Hall) is the focal point of a magnificent collection of architecture. German beer and cuisine were an integral part of the stop. 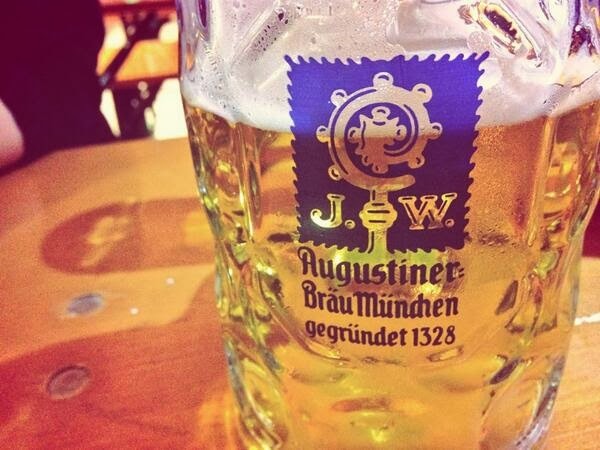 We visited two historic beer halls, Hofbrauhaus and Augustiner. Both of which had the expected excellent beer and great authentic eats. From what I had researched, Hofbrauhaus was more famous yet considerably more touristy (probably because of it's location a stone's throw from the square). This turned out to be quite accurate, however I would advise any beer lover, or really anyone interested in Bavarian culture to definitely make both of these spots high priority when in Munich. PS - Try the pork knuckle! One delicious litre of Munich's finest. Our time in Munich wasn't long, so other than wandering the Marienplatz area, the only other outing of note was to Olympic Park. This massive area of the city was designed for the 1972 Summer Olympics, however it was tough to get excited about it in 2014. A sprawling series of facilities that were no longer state-of-the-art, nor even really in use (granted, it was February). We paid about 5 Euro to head up to the top of the Olympic tower. The views of the distant Alps made the admission almost bearable, but all-in-all I would leave Olympic Park off your Munich itinerary. 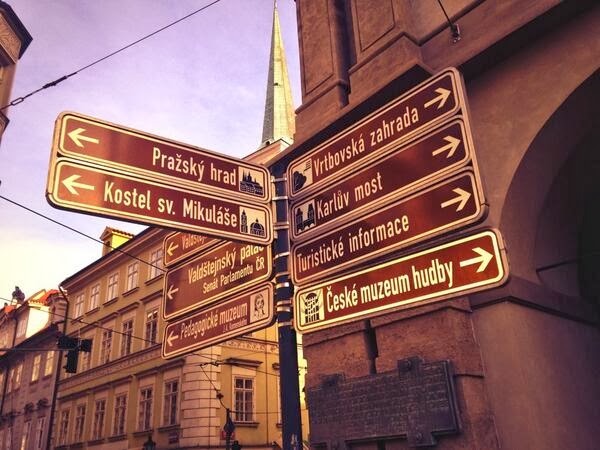 The next stop on our journey took us to Prague, the historic capital of Bohemia. Prague had been on my bucket list for quite some and it was almost surreal to think I was finally getting there. As we stepped off the bus and began walking down the cobbled streets towards our hotel, I couldn't help but feel more out of place than I had ever felt before. The city felt very eastern to me, sort of how I would imagine Moscow or Belgrade. The streets were constantly intersecting and the names nearly impossible to pronounce. When we finally came into the Old Town Square, we were relieved, but at the same time excited to explore this fascinating city. The unique language certainly adds to the allure. The "City of a Hundred Spires" is home to the most beautiful section of urban land I have ever seen. Staroměstské Náměstí (Old Town Square) is a marvel of architecture, a functioning work of art. Each of our three days in the city started and ended with a stroll-about/photo session with the historic centre of Old Town. Tyn Church & Old Town Square - at it's best at night. Coming in an admirable 2nd place on my Prague attractions list is Charles Bridge. The beautiful old gothic bridge connecting Old Town with Lesser Quarter. Hopefully the crowds aren't too thick and you can casually walk across while taking in the immense history and breathtaking views. Charles Bridge - Beautiful sites galore in Praha. Other highlights of Prague included the mammoth Prague Castle complex and the historically important/modern shopping destination Wenceslas Square. I wouldn't consider Prague a premier destination for foodies, but a great traditional restaurant to sample Czech cuisine was Kotleta, right in Old Town Square. The Czechs do know their beer though, Pilsner Urquell, the original Pilsner is the nectar of the gods! While my next venture to Germany will likely see me head north to explore Berlin, I can easily see myself returning to Prague soon, as three days was not enough to uncover it's vast beauty and intricate history. Thanks for reading. I'm currently continuing my European adventure in Northern Italy, and looking forward to posting again on Monday, ciao!